on Tuesday, 15 January 2019. Artificial grass products look luscious and green all year round, come rain or shine. We recommend using a professional installer to fit your chosen fake grass to ensure the area is sufficiently prepared and that the appropriate drainage systems are put in place. When installed by a professional, your artificial lawn can be walked over at any time during the year. During our British spells of rain, your lawn won’t become boggy and have pools of water develop on the surface reducing the risk of slipping in the mud and eliminating those muddy footprints being stepped through the house. There is a range of artificial grass products available for you to choose from to complement your garden, primary use or environment. You can choose from different pile heights, colours and textures. All of the synthetic grass products we supply at Unreal Lawns are hard wearing and UV protected to ensure long-lasting vibrancy that will keep your garden looking pristine for many years to come. Our products are suitable for both indoor and outdoor use so why not think outside the box and have artificial grass installed in your home? Fake grass requires little to no maintenance. Depending on your garden lawn’s primary use, there is minimal wear and tear, meaning no high maintenance costs and no need to spend hours maintaining your lawn. 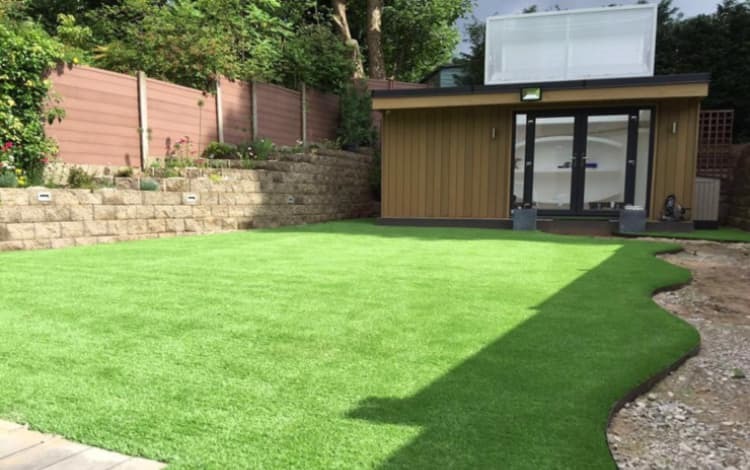 Find out more about how artificial grass can save you time and money. •	Elderly homeowners who find the upkeep and maintenance of their lawn a strenuous and demanding task. •	People who suffer from a physical disability and find it challenging to maintain their garden lawn. •	Homeowners who travel a lot or have holiday homes, where they are away for long periods of time. Other than clearing natural debris like leaves and twigs, synthetic grass products only require an occasional hose off. If the turf pile needs “fluffing”, simply use a stiff bristled brush to restore its fullness. Depending on the size of your garden, you may find yourself spending hours mowing the grass on a hot summers day, when really you’d much rather be sat back, with your feet up, catching some rays. Gardening machinery such as strimmer’s and lawn mowers are expensive, bulky and can be difficult to store. Find out more about how to maintain an artificial grass lawn in our blog post. Thanks to artificial grass products requiring such little maintenance, it makes it an environmentally friendly choice for a number of reasons. •	Reduced water usage. Artificial grass needs the occasional hose off. During our warmer summer months, your fake lawn won’t need endless watering and sprinklers being set-up like real turf needs to stay hydrated and living. Not only will your water usage decrease, but your water bills will decrease too! •	No petrol emissions from lawnmowers. Because our grass products don’t need cutting, you instantly reduce your carbon footprint by not needing to use a petrol lawn mower. •	You don’t need to use harsh chemicals or fertilisers to keep your lawn looking vibrant and green. Artificial grass looks beautiful all year round. Artificial grass is becoming increasingly popular for pet owners and is loved by dogs as it’s soft under their paws and it's generally very pet-friendly. Fake grass is easy to clean and can be installed with effective drainage to help urine flow through. Solid waste is easy to pick up from your artificial lawn and your grass can be quickly rinsed off when required. Read our 5 Reasons Why Your & Your Dog Need An Artificial Lawn. If your grass is prone to dry brown patches in the height of summer, or you have a pet dog whose urine causes your grass to discolour, artificial turf is for you. All of our synthetic grass products are hard wearing and UV protected, meaning they don’t wear or discolour when peed on or exposed to the sun. Tired of losing your step thanks to pits, dips and holes in your lawn? When installed by a professional, your new artificial grass will be laid on a flat surface that has been specially prepared before installation. And what’s more, you won’t be finding bones buried around your garden as your dog will no longer be able to dig up your lawn where there’s fake grass. For a child-friendly garden, artificial grass really takes some beating. There’s a reduced concern when children fall over on to a hard surface as fake grass is softer to fall on. You no longer need to worry about your little ones coming into contact with nasty fertilisers and chemicals either as your artificial lawn will stay pristine all year round. Find out more about How to Use Artificial Grass for a Child Friendly Garden. Spring is a beautiful time of year where skeletal trees return to being densely green, flowers start to flourish, and for those who suffer from hayfever, it brings a time of despair! As the lawn mowers come out in force and the aromas of freshly cut grass fill the air, we gather our survival kits of tissues, eye drops and anti-histamine in a fight against the dreaded "H-word" - hayfever. One of the many benefits of artificial grass is that fresh grass cuttings are a thing of the past and you can instantly eliminate the presence of grass pollen in your own garden. While it may not cure hayfever, you’ll benefit from some relief. Artificial grass has a long-life span when installed properly by a professional. You can also prolong its life expectancy by maintaining your fake lawn with the occasional wash and brush to keep the pile looking clean and fluffy. Aesthetic wise, synthetic grass products have a long-lasting luscious green appearance all year round. For more information on our artificial grass products, please contact us.